A community fighting the ravages of the sea is a step closer to a multi-million pound coastal defence system to protect homes. 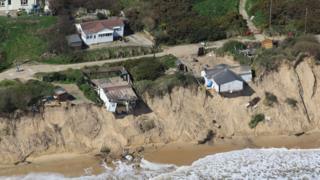 Several homes in Hemsby, Norfolk, have been lost after storm surges pulled away metres of sandy cliff edge. An environmental impact assessment is under way that will pave the way for planning permission for a "rock berm" to be put in place. A campaign spokesman said: "People are nervous; they need security." Seven bungalows along The Marrams in Hemsby were left uninhabitable and had to be demolished when sandy cliffs washed away in March 2018. The area was devastated in December 2013 by "the worst storm surge in 60 years", which destroyed seven homes. Ian Brennan, chairman of Save Hemsby Coastline, said, if permitted, the rock berm would stretch for 2km (1.2 miles) along the Norfolk coast, from Winterton to Scratby. But the defences were likely to last only 25 years, he explained. "Homes are still under threat: 20 immediately, and then there's another 100 behind that. "We owe it to our village to do something. "We were told in 2013 that this was a 'once in a lifetime' thing, but then the 2018 storm happened. This could potentially continue every couple of years." He said 70% of Hemsby's income was generated by summer tourism, with the local population increasing fivefold during the holiday season. A spokesman for Great Yarmouth Borough Council said the rock berm would "help to manage and reduce the rate of erosion; not prevent it". The council had submitted a request for funding from the Environment Agency for a study, he said. Other options being considered included the "roll back of vulnerable properties to adapt to the changing coastline", he said. Once planning permission is granted, the process will begin to raise the money needed to install the rock berm, likely to cost between £3m and £9m. It will be raised by a combination of local business contributions and central government, Mr Brennan said.